89Agave in Sedona takes its name from its location on Highway 89 in the heart of uptown Sedona. Dine on the inviting patio with its beautiful red rock views, or in the colorful and vibrant dining room. Recently renovated and launched - the spot was formerly Taos Cantina - this Sonoran Mexican spot is owned by the same group behind the acclaimed L'Auberge property. Executive Chef Mark May helms the kitchen and on a beautiful November evening in Sedona we're told everything is made in-house and from scratch as we settle in to explore the menu. What to start with? Margaritas of course, and a flight is the perfect way to sample. In addition to the large selection of tequila, the well-made specialty margaritas use tequila infused in-house. From left to right: Serrano-infused tequila with pineapple, jalapeño-infused tequila with cilantro, hibiscus-infused tequila with damiana (a Mexican herb), and cinnamon-infused tequila with orange. 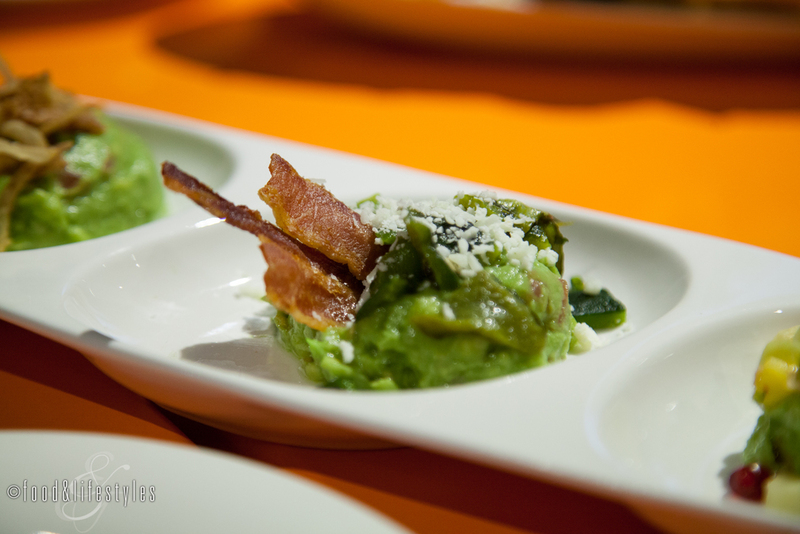 I loved the creative variations of the guacamole trio featuring a traditional guacamole made with cilantro, lime juice, and jalapeno gussied up three ways: Pomegranate, mango, and almond; bacon, poblano pepper, and cotija; shrimp and crispy onion. They were the perfect starter as we dove into our multi-course Mexican feast. 89Agave's crowd-pleasing nachos layered house-cut and cooked corn chips with pulled chicken, slow-cooked black beans, Oaxaca and cotija cheeses, fresh pico de gallo, a drizzle of crema, pickled jalapeños, and guacamole. Another favorite at our table was the grilled corn draped in a tangy chipotle aioli, garnished with crumbly cotija cheese and fresh cilantro, and served with juicy lime wedges. Sonoran Quesadillas plated golden wedges of tortillas sandwiching a filling of plump achiote and citrus-marinated Mexican white shrimp, poblano peppers and melted queso Oaxaca. The Taco Wedge Salad arrived as petite wedges of crisphead lettuce crowned with black bean and corn salsa, avocado, creamy chipotle ranch dressing, and chile threads. A flavorful chicken broth studded with corn and other vegetables made this tortilla soup stand out. The finishing touches were traditional toppings of tortilla strips and avocado with a squeeze of fresh lime. Enchiladas delivered corn tortillas rolled around a filling of chile-spiced shredded chicken and melted queso Oaxaca in an achiote and guajillo pepper sauce. Hefty burritos can be ordered rojo (red) or verde (green). The verde featured a spinach tortilla packed with a filling of marinated steak and shrimp with Mexican rice, black beans and chimichurri nestled in a tomatillo crema sauce, while the toasted chile tortilla for the rojo was stuffed with rice, beans, and tender slow-cooked carnitas, garnished with pickled onions, and served on a pool of flavorful achiote sauce. We managed to save room for postres and we were glad we did with this decadent trio, any of which I would order again: Bavarian cream-stuffed churros served with rich chocolate sauce, cinnamon sugar-dusted sopapillas, or creamy cajeta pudding. What made this finale even better? A pairing of AsomBroso tequila aged 5 years, with honey notes that made a perfect accompaniment to our sweet treats. At 89Agave, feel free to explore the more than 60 equilas offered with helpful GM Jordan ready to answer any questions. Headed to Sedona? Add 89Agave Mexican Cantina to your restaurant list. It is open 7 days a week, 11 am to 9 pm with al fresco dining on three outdoor patios and Happy Hour 3 pm to 5 pm with drink and appetizer specials. Click here for a travel feature on my Sedona trip and stay at L'Auberge de Sedona. I was hosted as part of a culinary and travel press trip and my meal was complimentary.